Celebrating Polish Independence Day in advance, Paderewski, Szymański and Lutosławski with the BBC Symphony Orchestra conducted by Michał Nesterowicz at the Barbican and on BBC R3. To start, Edward Elgar's Polonia op76 (1915), a statement of hope, written at a time when Poland didn't yet exist except as part of the Austrian and Russian Empires. It blends themes from Chopin and Paderewski in a mix of grand orchestral music, mazurkas and marches with quotations from Mazurek Dąbrowskiego, the Warszawianka and other Polish patriotic songs. Though Polonia might not be Elgar premier cru, it's a showpiece, good for occasions like this, reminding us that the connections between Britain and Poland go back a long way. In this wave of post-Brexit racism, we must recognise that Poles are not "the enemy" but very much part of the community. Thousands of Poles escaped to Britain, either from pogroms in Russia or from other suppression, after 1914, after 1939 and since the fall of the Iron Curtain. Polish immigrants are the biggest European minority in this country, and form the backbone of the economy in all sectors. British music has been enriched by Poland, not just through greats like Chopin and Liszt but by the integration of composers like Szymanowski, Lutosławski, Panufnik and others into the DNA of modern British performance practice. 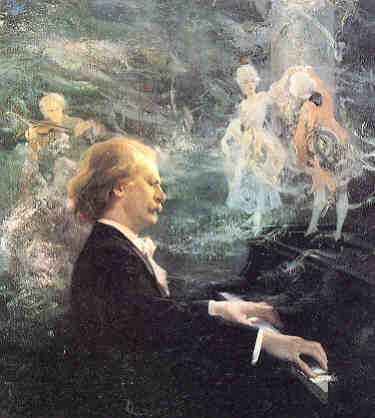 Elgar's Polonia was dedicated to Ignacy Jan Paderewski so fittingly, it was followed by Paderewski's Piano Concerto in A minor op 17, premiered in 1889 by Hans Richter, who was close to Elgar and to Parry. The soloist here was Janina Fialkowska. A dramatic opening gives way to an allegro at times expansive and serene, the piano's rippling figures complemented by emphatic chords in the orchestra. The second movement is romantic, with lovely parts for violin and cello. The finale is rousing. Like the composer himself, it's appealing, though maybe not material for virtuosic celebrities. Like Polonia it is a gesture which needs to be heard.